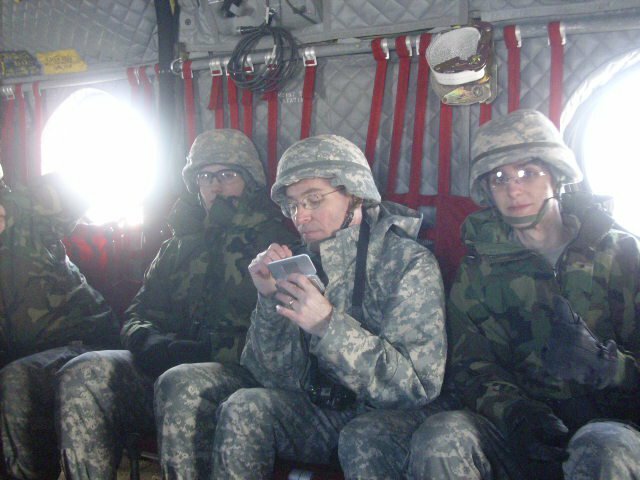 Recently the Basic Course Cadets from the Golden Knight Battalion took a little helicopter ride. For the past few years Clarkson Army ROTC has been able to request New York Army Nation Guard helicopters to come support our training. The excitement and anticipation always builds each year as the day gets near. We had to get ID tags for all the cadets to ride in the helicopters, and if a cadet thought that the information required to get the tags made wasn’t making it up the Cadet chain of command, there was almost panic, for fear of not getting the helicopter ride. The day of the ride, approximately 30 minutes before the scheduled start of lab there was a rumble in the sky. The Cadet Battalion Commander posted on facebook. 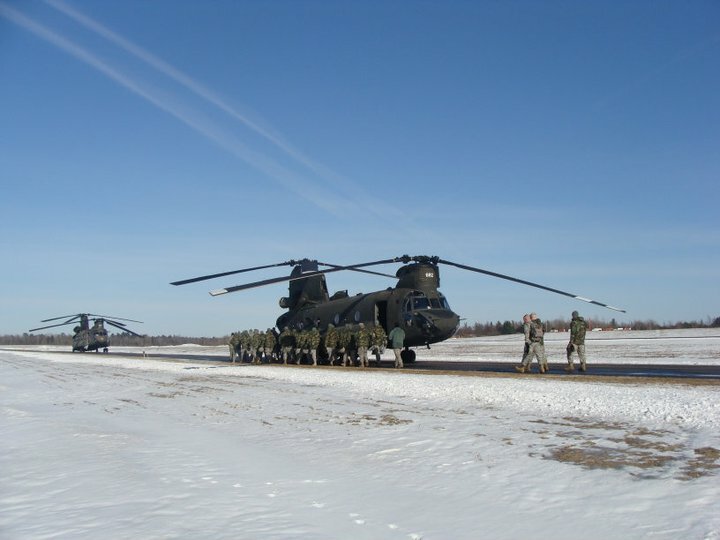 The Chinook helicopters landed at Damon Field, the airport in Potsdam, NY. the cadets were organized into groups to board the two aircraft by the Senior Cadets. The Cadet in charge, Cdt/Major Phil Ables is actually a member of the National Guard unit as an SMP cadet, and this exercise gave him a good opportunity to work with his assigned unit. He plans to go to flight school after graduation, and hopefully return one day for airlab as the pilot. The Cadets received a safety brief from the crews prior to boarding the aircraft and half of them loaded the aircraft for the first flight. As the engines started to turn all the cameras and camera phones came out. This is probably the most documented lab we have ever had. The number of posted pictures and videos were amazing. Not to be scooped I got busy on my smartphone. The cadets that participated in the lab all had big smiles on their faces, and great stories to tell all their friends when they got back to campus. Thanks to Cadet/Major Ables for coordinating, and the NYARNG for supporting a great day of Army Training. You can also read more about the adventure on Cadet/SGT Matt Flynn’s Army Stories Blog. He has video of Potsdam from the Air. Awesome Post! Air Lab was always one of my favorite times at GKB! 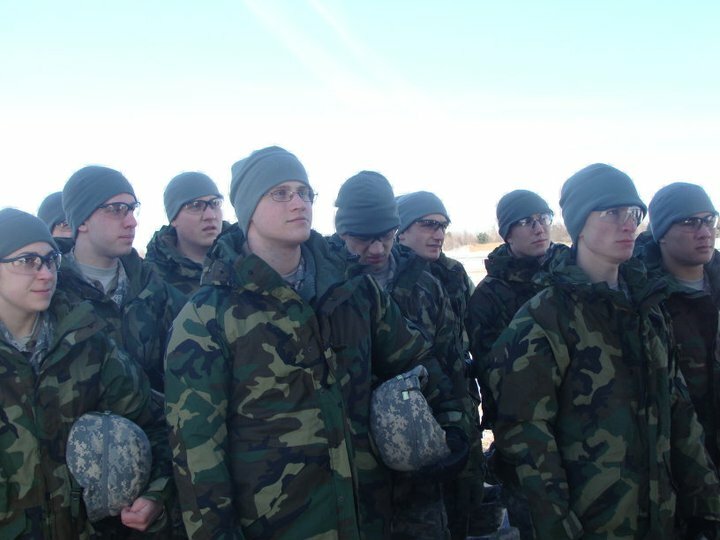 I respect all these Cadets that have made the Military a part of their lives . So many hundreds of thousands of great American Military have contributed to the freedom of our lives in This great Country . Unfortunately om so many ways it’s a thankless venture . The sacrifices that Military men and woman must endure is far more worthy than a pat on the back at the airport and 15 minutes of free calling card to speak to your family . 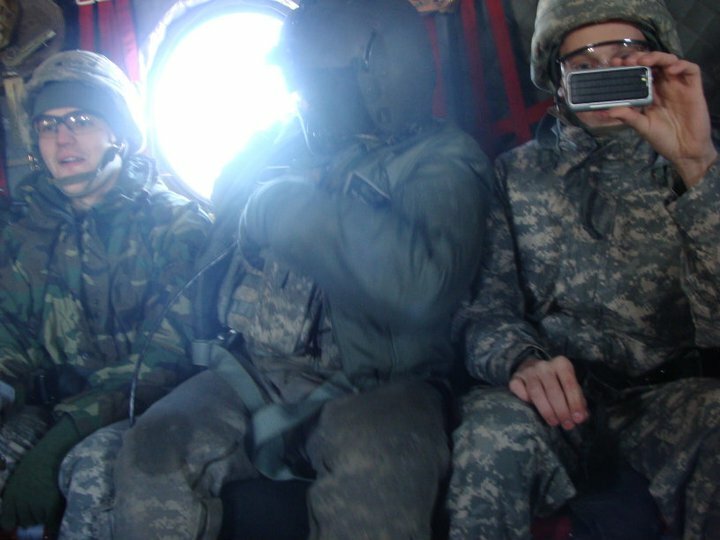 I have also had the experience of many rides in a Chinook , not one of them was fun ! It was transporting fellow soldier and and a close friend which committed suicide due to the stress of war ! When you are flying in a Chinook with the fear of being shot and killed , it really takes the fun factor away from the ride . It is a benefit for me to hear someone say ” I thank you for your service ” when I know that person has been there or has been touched in such a dramatic way as loosing a loved one in a combat zone . Rather than someone saying that with no experience just to be politically correct . I believe everybody should do their part for the war on terror . Im not sprey to say that cutting the hair of someone that may enter the Military isn’t quite enough that our great Country needs to pay the high price for Freedom !